Drug cartels and beauty pageants aren't exactly two things one might naturally pair together and certainly aren't two things one might believe to have similar skillsets, but in these opposing actions we find some crossover and it is in this intersection of the two as presented in 2019's Miss Bala that we find the most interesting theme director Catherine Hardwicke's (Thirteen, Twilight) film has to offer: appearance, pretense, facade. Both worlds in which these two seemingly distant activities take place present this outward appearance where it is key to maintain the less than pleasant reality behind the scenes. While no expert in either drug and weapons trafficking or in beauty pageants, it would seem that within a drug cartel what the money can buy you is obviously flaunted in the forefront while the dirty work is kept behind closed doors while with beauty pageants what is presented is the whole point and the whole point is to be pretty and appealing, but what no one sees is the hard work and dedication it takes to present such a veneer. What is interesting about this though, is that in keeping up such appearances the individual must learn to exude a certain level of confidence, to truly build this exterior based on their look and the way they carry themselves that might be completely misleading or the exact opposite of what they might be feeling inside. Of course, this could be true of any number of things and in any number of professions, but it is these parallels that the film examines and ultimately utilizes to its substantial advantage that give Miss Bala just the slightest amount of weight whereas otherwise this English-language re-make simply settles into a pattern of being a mostly interesting action noir of sorts if not ever being as fun as it feels it should be given the baked-in premise of this average, every-day protagonist discovering her own sense of worth and inner-strength that allows her to be able to combat this situation she's fallen into completely by accident. Gina Rodriguez (TV's Jane the Virgin) is more than formidable given what the role calls for and she graphs her character's arc in believable fashion, but it is the otherwise routine direction and lack of intuition into tone on the part of Hardwicke that levels the themes and character work clearly at play here. Based on the 2011 Spanish-language film of the same name by writer/director Gerardo Naranjo which in turn was based on a true story about an actual connection between the winner of the 2008 Nuestra Belleza Mexico pageant and a cartel, Hardwicke's Miss Bala changes things up ever so slightly as Rodriguez's Gloria is now a make-up artist living in Los Angeles who travels back to Tijuana to help lifelong friend, Suzu (Cristina Rodlo), as she competes in the "Miss Bala" pageant. While I haven't seen the original, seemingly grittier and more brutal portrayal of this young pageant contestant forced to do favors for a Baja California cartel what both films do seem to have in common is this strange, but fact-based history of pageant queens and Mexican drug cartels. Upon first meeting Gloria, Gareth Dunnet-Alcocer's screenplay sets her up as this innocent and somewhat naive young woman, but only naive in the way that she doesn't know how Mexican drug cartels work which is to say the majority of us would come off as naive and sheltered were we thrown into such a situation. More importantly is this facet of Gloria that she is easily intimidated and somewhat afraid to take the reins of her own life as she works hard to show her worth, but allows herself to be shot down just as easily. This trip to Tijuana to reunite with Suzu is very clearly an escape of sorts though leading Gloria to maybe take more chances and be a little more brazen than she might typically allow herself to be which is why she ends up in a night club with Suzu as she attempts to get close with the local chief of police, Saucedo (Damián Alcázar) is who said to have great influence on the pageant. This night out quickly turns deadly when Lino (Ismael Cruz Cordova), the ringleader of the biggest cartel in the area, and his fellow gunmen invade the nightclub seeking the chief of police as well. Gloria and Suzu are separated with Gloria ultimately coming into the possession of the cartel where she is kept alive largely due to her U.S. citizenship and the fact she might be of some use to them. After Gloria explains that she is only visiting and now looking for her missing friend, Lino agrees to help her find her find Suzu if she agrees to work for them. As Gloria becomes caught in the cross-hairs of drug gangs and the DEA, it's unclear how she might survive. 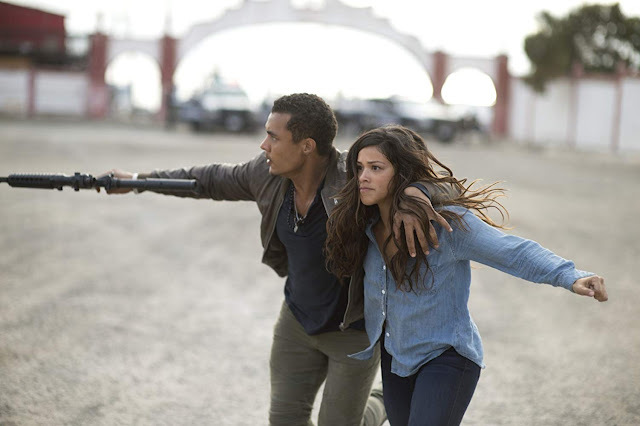 Gloria (Gina Rodriguez) is caught between drug lord Lino (Ismael Cruz Cordova) and the DEA in Miss Bala. While Hardwicke has proved an interesting director in the past this has largely been in regards more to project choice than it has directorial efforts in general. Hardwicke has only written two features and both have been done with writing partners while her projects she's done as a director-for-hire have suffered by seeming as if they have no distinct directorial voice to them. The same can largely be said for Miss Bala as the film looks as if it were shot with the eye of about as mainstream a filmmaker as it gets; meaning there is nothing glaringly unique or interesting about the way in which she captures these, admittedly tense, events. Where the film does make some deviations from the action/thriller conveyor belt are largely in the character department as the change in the character of Gloria from a pageant contestant who lives and works in Tijuana to a Mexican girl who grew up in America, doesn't speak fluent Spanish, and upon returning to Tijuana doesn't feel like she fits in touches upon this great sense of not belonging anywhere; such circumstances have molded this identity crisis which can again be related back to Gloria's lack of self-worth that is demonstrated from the first moment we meet her on screen. Naturally, given the aforementioned beats of the plot one might guess that Gloria's insecurities and self-esteem grow exponentially over the course of the film, but the fact this change was made in the transition from Spanish to English-language iteration adds a layer not only of necessity, but of the complexities and fears born not only from the situations we find ourselves in, but also the ones we encounter and have to overcome internally. 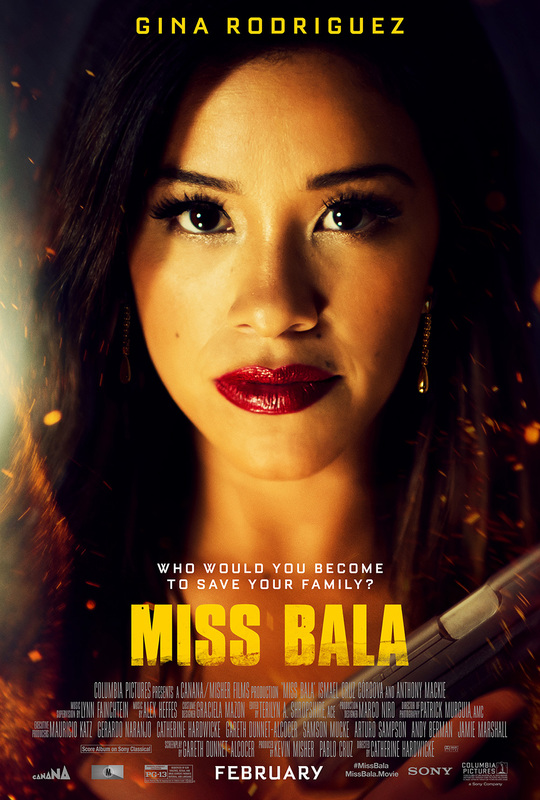 Making this hill harder to climb is the other character/reason that the script offers up lending Miss Bala more shading than it might initially appear to possess. Cordova's very clear-cut bad guy is given a fair amount of leniency simply for the way he looks, but as we come to know this perception of him that he allows Gloria to see, the audience in turn begins to experience some symptoms of Stockholm syndrome. Cordova is able to elicit a sympathy for his character that feels founded in this idea that he had no choice but to grow up and become the man the world has now made him out to be. Both Cordova and Rodriguez offer smart, grounded performances, but they are largely in service of a movie that spends more time hitting the necessary quota of generic shootouts than it does digging into these more potent areas of character possibilities. It should also be noted that Anthony Mackie shows up briefly as someone who may or may not be who he appears to be, but Mackie is ultimately little more than a blip on the radar here...much like the movie itself will be in regards to films released in 2019.